When I was a kid you judged a good party by the eye popping colour of its food offerings. Any decent party spread was a riot of colour – pink and green lamingtons, fire engine red frankfurter sausages, fairy bread, jellied orange quarters, green and red pickled onions, bowls of garish lollies and iced fairy cakes. I still love a colourful party spread but without all the artificial colour and flavours of my childhood feasts. 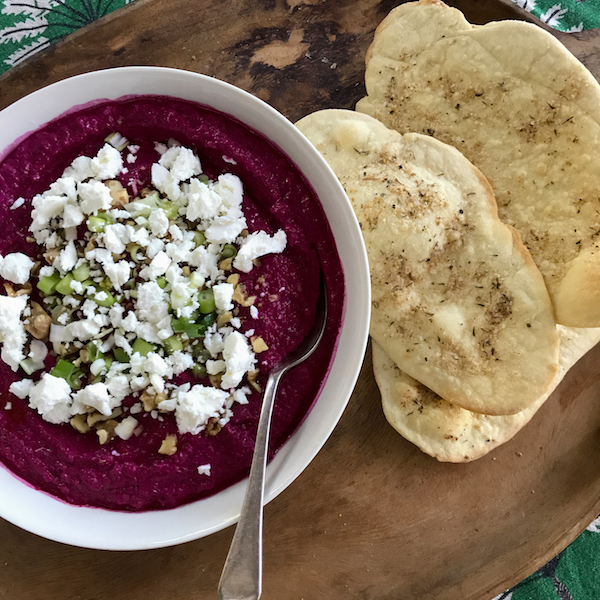 This is why the hot purple-pinkness of this mashed beetroot dip screams party, party to me. Homemade olive oil crackers make this a spectacular appetiser to kick off any party. The garnish of the goats cheese is an essential element, the tanginess of the cheese offsetting the sweetness of the mashed beetroot. Preheat the oven to 200C/180 fan forced. Wash beetroots and roast whole in in oven until they are tender to poke with a knife. (about one hour) Allow to cool, peel and chop roughly into about six pieces. Process beetroot, garlic, chilli and yoghurt in food processor until smooth. Place in a large mixing bowl and mix through zartar, maple or date syrup, olive oil and one teaspoon of salt to taste. Transfer the beetroot mashed beetroot into a shallow serving plate and spread mash around. Garnish with spring onion, nuts, cheese and a drizzle of olive oil. Serve at room temperature.